It takes us Independents to raise the failures that both Labour and Conservative parties have failed to address. Just as with the scandal of the Arts Complex millions, supported by Labour and the Conservatives, the two-party system has failed the City of Southampton for too long. Whilst the Arts Complex drains public funds, children are being put at risk and care centres for the elderly have been closed. Whether it is Labour or Tory, it's the same old story. "After many years, there continue to be very serious problems with the council's Children's Services. Neither the Conservatives, nor Labour, have addressed these problems and children continue to be put at risk by the council's failures." We have thanked the journalist Maxwell Kusi-Obodum for writing the articles and wished him well in his new job after leaving the Echo. It was Councillor Pope who asked the Echo to cover this crisis in the safeguarding of children and families, after uncovering serious problems with the way Southampton City Council is failing to deal with child safety over a long period of time. Councillor Pope was dealing with cases where families had come to him to complain of how the Council had failed to protect children and families. And when he raised these issues with officers of the Council, the response was appalling. That is, when he could actually get a response! "This Council is a risk to children and their families. For months, officers of the Council ignored us. The child ended up in hospital. OFSTED need to come back! 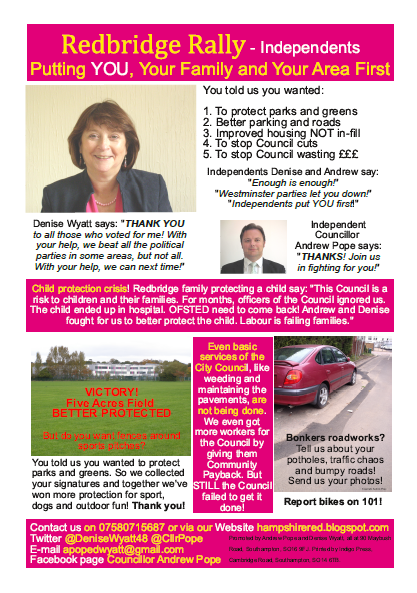 Andrew and Denise fought for us to better protect the child. Labour is failing families." Councillor Pope and Independent campaigner Denise Wyatt consistently raised serious concerns about child safety in Southampton. But like this family, they were ignored or given misleading information. Andrew and Denise tried to get an answer to the question as to why there was double the national average of "children looked after" in Southampton. Since 2015, answers have not been forthcoming from the Leader of the Council Labour Councillor Simon Letts, the Director of Children Services (now departed), senior social workers and the Labour Councillor Eamonn Keogh whose job is to scrutinise the Labour Council on children and families. Yes, that's right, a Labour Councillor was appointed by the Labour Party to scrutinise a Labour Council - what a shameful conflict of interest! No wonder the Council is in such a state. Councillor Pope even tried to get an answer at the November 2016 Full Council, from the Cabinet member responsible, Councillor Paul Lewzey. He avoided the question and gave no answer. This was in full view of the Daily Echo journalist Mr Kusi-Obodum, who was astounded at the lack of response - and subsequently wrote the second article mentioned above. This Labour Council simply does not know why it has this Child Protection Crisis. "Cllr Lewzey said that the legacy of the serious case reviews were that the authority and other family agencies were “better” at spotting children at risk needing to be taken into care." "I was in tears when I heard this Labour Councillor had said such an upsetting thing. It is shameful that in the Daily Echo this Labour Councillor and the Labour Council seek to blame Southampton's families instead of taking responsibility for their own failures and failing to address years of neglect by the Council." "OFSTED need to come back now! The situation is grave. Child safety issues are amongst the most serious issues that a councillor and campaigners can deal with. We have a duty to protect children and families and to blow the whistle." We have contacted OFSTED and asked them to come back to Southampton to reassess the Council. The seriousness of the failures of Southampton City Council, whether under a Labour-run or Conservative-run Council, cannot be overstated. If you have a child or a family that you feel is being put at risk, please get in touch and we will take the case up for you. And when the time comes, please vote for more Independent councillors. Independents are the only councillors who put the people of Southampton first, not the political party and not covering up due to the failed two-party system of Labour or Tory. Independents stand up for you. We will keep fighting for you.